This instrument is used to measure and eliminate the static charge from the person who works for an electronic company, chemical industry, or explosive industry. This instrument is ideally design to mount near by the entrance of ESD safe work place, a person who enters such place has to be grounded the static charge before entering the hazardous work place and one should touch the button to read the charged amount and as well as to ground oneself. 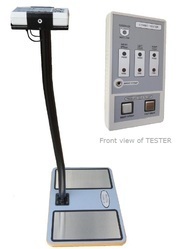 Combo Tester is the instrument which is used in an Electronic or Chemical Industry, and ideally it has to be placed near by the entrance and it comes with stand optionally at extra cost, the usage of the instrument is to check the following. 1) wrist strap and its connectivity with you, if the wrist strap you are using is faulty or if it is not in perfactly contact with you then it gives you buzzer while testing. 2) Footwear also can be tested using this instrument and it shows you whether the footwear you are wearing is anti static or not, the ability of this instrument is to show both left and right footwear. 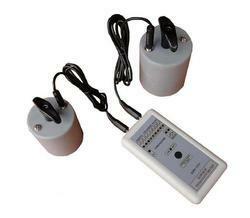 The model SCM – 02 static charge meter is a lightweight, precision electrostatic charge meter that features stabilized sensor for accurate measurement. The maximum measurement range is from 0 to 10 KV at meter to object distance of one inch. 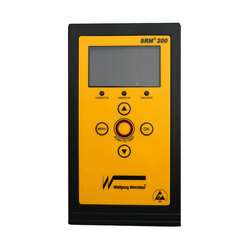 A 2-1/2-Digit LCD provides 100-Volt resolution with polarity indication. 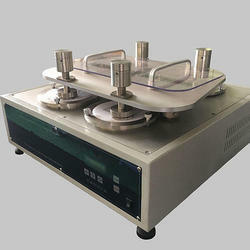 This instrument is used to classify the product into Conductive, Static Dissipative, Anti Static or Insulator. This instrument is also used to check the surface resistance of any product, as well as to check the grounding continuity using optional external probes. This instrument is also works like normal surface resistivity meter, but SRM-100D is the analog one, and this is a digital one. It gives you the testing value in digits and accurately. Surface Resistivity Meter With Probes: The model SRM – 02 surface resistivity meter is a portable, versatile, instrument designed to accurately measure resistance between two points, surface to ground, and surface resistivity is accordance with EOS/ESD Association standard S-4.1. 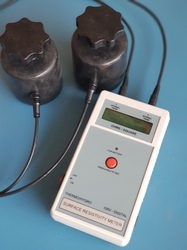 The surface resistivity meter (included Testing & Measuring Probes) is designed to make all the measurements. Optional : Testing & measuring probes. Foot wear is the first line of defense against electrostatic charges builds up on the human body. It is designed to carry away this charge as soon as it is generated. At the same time Foot wear must remain electrically safe for the user. Thus, it is important to test every Foot wears regularly. In order to protect the sensitive electronic components the maximum foot wear resistance should not be more than 100 Meg ohms on the other end. The resistance should not be less than 0.75 Meg ohms as protection to the wearer from dangerous level of the voltage and current flow. The foot wear tester checks these parameters under actual operating conditions with the foot wears. It clearly indicates weather or not the resistance of the foot wears system including the wearer is at least 0.75 Meg ohms and note more than 100 Meg ohms respectively. Specification : Range : Foot wear 0.75 to 100 Meg ohm. Indications : Pass – Green Led , Low & High Fail – Red Led. This is a very special designed stand to eliminate static electricity of human being whenever a person just touches this stand. This stand provides a control conductivity, which drains static less than 10 seconds. Without getting a shock. Two wires are provided one connecting from top to bottom and other is for grounding. For human safety the stand provides a resistance to ground in range of 1 meg – to 10 meg range. For human safety. This stand is having adjustable height. And are kept at the entrance of the room or near any place where a person just touches this stand and start his routine work. This is one of the easy way to drain static electricity to the ground.